Scores of cyclists — some in their undercrackers, others stark naked: it's become a familiar London sight over the past decade and a half. 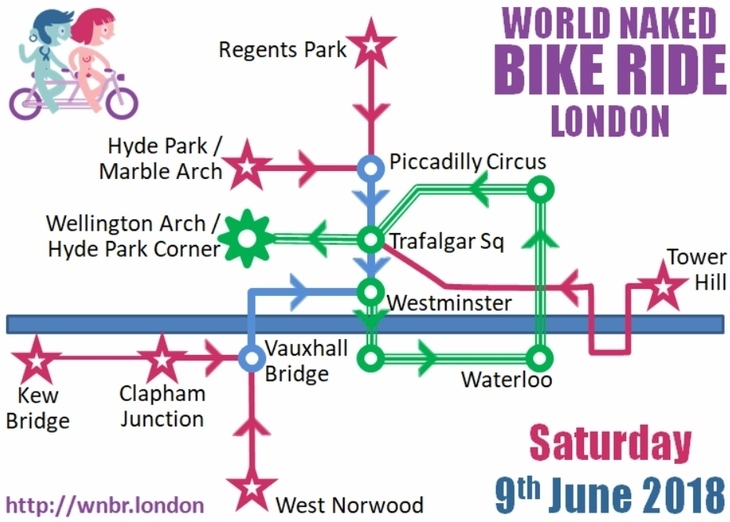 World Naked Bike Ride returns to the capital on 9 June for its 15th annual outing — a fleshy protest on wheels, sticking up for a roster of causes, including cyclists' rights, body freedom, and the the fight against global dependency on oil. Cyclists pass through central London, taking in landmarks including the Houses of Parliament and Trafalgar Square. Bikes set off at various times in the early afternoon: some of the start points have events taking place earlier in the day. Check out the website for more details. There're also an after party for participants. It's one of the few parties we know of where dress isn't required at all — let alone formal.